The United States Congress designated the Fort Niobrara Wilderness (map) in 1976 and it now has a total of 4,635 acres. 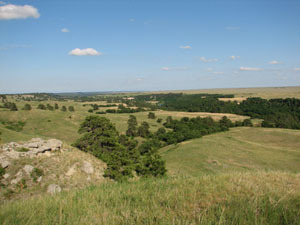 All of this wilderness is located in Nebraska and is managed by the Fish and Wildlife Service. Herds of bison and elk find sanctuary in the rolling sand hills of Fort Niobrara Wilderness. Just outside the Wilderness boundary, little remains of the fort that once protected northern Nebraska settlers. The only surviving colonists, prairie dogs, have taken up residence in "dog towns" beneath the wildflower-scattered grasses. The Niobrara River flows swiftly through the Wilderness, creating a canyon riverine ecosystem of trees and bushes and attracting summer canoeists. Elevations, here, range from about 2,300 to 2,700 feet. Some of the deciduous trees growing along the river are ironwood, bur oak, box elder, and hackberry. Ponderosa pine is the dominant tree in the dryer savanna areas. A nice mix of native grasses such as sand bluestem, prairie sand reed, Indian grass, side oats grama, porcupine grass, and buffalo grass grow in the prairie areas. Bison winter in the Wilderness, then head south of the river for the summer. July temperatures average between 52 and 110 degrees F and between -25 and 58 degrees F in January with a total of 17.8 inches of precipitation falling annually. Day-hikers can have a great adventure in the Wilderness year round. No maintained trails offer access north of the river. The Fort Falls Trail is maintained on the south side of the river. Planning to Visit the Fort Niobrara Wilderness? How to follow the seven standard Leave No Trace principles differs in different parts of the country (desert vs. Rocky Mountains). Click on any of the principles listed below to learn more about how they apply in the Fort Niobrara Wilderness.